Yay! Baby Hazel’s parents are taking her to Disneyland! Baby Hazel is very excited. It is her first time going to the famous amusement park. But she needs help packing for the trip! There’s so much stuff to take and she has to leave in three minutes! Help her collect her things and fill her bag, then make sure she has all her accessories including her hat, camera, and sunglasses. You might even need to calm her down if she gets upset. The quicker you get ready, the happier she is, so let’s get going! There’s so much to do in Disneyland! Baby Hazel wants to take pictures of Mickey and Minnie. Then she gets to try out all of the different fun things to do. She might get hungry, so be ready to give her a snack. If she gets upset, rub her head in a circular motion until she feels better. She’ll get to make cotton candy by mixing the ingredients putting them in the machine, and then adding the stick. Mmmmm! The haunted house is a little scary! You may need to calm her if she gets upset, again by rubbing her head in a circular motion. Once she is happy, she may want to play with a mermaid and go on a cart ride. If she drops her things, help her pick them up and put them in her bag. Feeding birds is fun! She may want to go on the carousel. The ferris wheel may make her upset, so be ready to help dry her tears. The train is a fun ride that might need an extra push, and everyone loves the bouncy house! If you get stuck, remember to watch what the baby is thinking and to place the object where the floating white hand is pointing to. Sometimes you will have to place Baby Hazel nearer to an object so that she can interact with it. 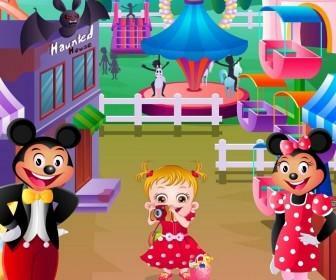 Baby Hazel in Disneyland is a simple point-and-click flash game that can be enjoyed by anyone. 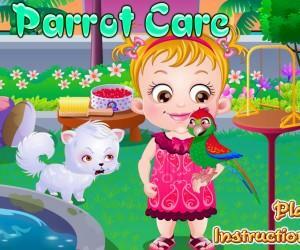 It helps young children develop their motor skills and their object identification abilities. Each game is timed and scored in a relaxed, fun manner. 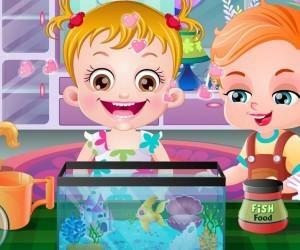 Play as often as you like, and check out our other fun games at www.gamesbabyhazel.com! Hurray! Baby Hazel’s parents want to give her a memorable holiday treat, in the Disneyland! Baby Hazel is so much excited and joyous about her first visit to the most amazing amusement park. Help Baby Hazel to pack the required stuffs. Take her to the Disneyland and enjoy different activities with her.